ORLANDO, Fla., Nov. 30, 2005 (PRIMEZONE) -- Northrop Grumman Corporation (NYSE:NOC) has been awarded the 2005 Defense Manufacturing Technology (ManTech) Achievement Award by the U.S. Office of Naval Research for extraordinary accomplishments on the U.S. Navy's next-generation destroyer program, DD(X). Established in 1999, this award distinguishes teams dedicated to advancing the nation's defense with innovative and affordable technology. The award was presented to Northrop Grumman Ship Systems' DD(X) ManTech project team at the Defense Manufacturing Conference. 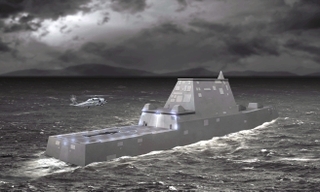 "The DD(X) program has revolutionized shipbuilding by perfecting composite-to-steel integration for future surface-ship platforms," said Paul Robinson, vice president and general manager of surface combatants for Northrop Grumman Ship Systems. "As the recipients of this prestigious award, we are committed to providing the 21st century warfighter with unparalleled capability." The ManTech Achievement Award specifically recognizes the composite-to-steel joint development for DD(X). This exceptional ship features an all-composite deckhouse joined to a steel hull. The revolutionary adhesive technology designed for the DD(X) significantly improves performance and increases survivability while reducing in-service maintenance expense. The joint is 40 percent lighter in weight and 50 percent less expensive to produce than existing configurations. "Not only has this DD(X) team employed the most cost-effective manufacturing techniques," says Brian Cuccias, vice president and DD(X) program manager for Northrop Grumman Ship Systems, "they have laid the foundation for the future of composite ship design." In partnership with the Navy, the DD(X) ManTech project team includes employees of Northrop Grumman Ship Systems; General Dynamics' Bath Iron Works; the Composite Manufacturing Technology Center of Excellence, South Carolina Research Authority; Pennsylvania State University's Applied Research Lab; The Boeing Company; and the Edison Welding Institute.